Windows 8 desktops and laptops are making their way into K-12 environments owing to tight integration of the Windows operating system (OS) with Windows servers and network infrastructures, the need to leverage existing investments in Microsoft Office applications, and support for Microsoft’s SkyDrive. Microsoft recently released its much-anticipated Windows 8.1. Should you upgrade? Perhaps. Read further to decide. Quality and Effectiveness: The Windows 8.1 upgrade boasts a faster startup, a new startup screen, and a Search command feature (integrated with Microsoft’s Bing search engine) that will search for files on your local machine and the Web. New and experienced users will appreciate the return of the Windows Start button. Ease of Use: The Windows 8.1 interface is optimized for touch screens and tablets, but it also works with a mouse and keyboard. A new tile called Help + Tips on the Start screen offers to teach you more about starting up, the apps installed with the Windows 8.1 upgrade, how to get around, basic touch actions, how to manage your account and files, various settings options, and what’s new. Creative Use of Technology: There are many ways to personalize the Windows 8.1 interface. For example, you could sign in to Windows 8.1 with a picture password and some on-screen gestures (e.g., a combination of circles, straight lines, and taps) instead of your Microsoft ID. You can customize which apps appear first when you sign in. You can run a photo slide show on your lock screen. Microsoft also added a Reading List app to keep track of articles and other Web information you may want to read. Unfortunately, I ran into difficulties getting this feature to work with Internet Explorer and Firefox on my Windows 8.1 tablet. It did work flawlessly with Bing News and Sports apps. 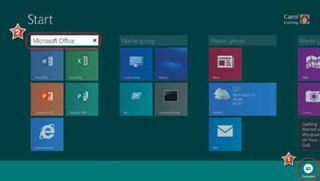 Suitability for Use in a School Environment: Several features in the new Windows 8 upgrade make it suitable for schools. For example, in Windows 8.1, the Microsoft Messaging app has been replaced with Skype. For back-end work by the district technology department, the new Windows 8.1 offers support for OMA-DM (Open Mobile Alliance Device Management). This means that network managers aren’t limited to Microsoft’s System Center 2012 R2 Configuration Manager to administer Windows 8.1 devices. Several third-party solutions will work as well, including AirWatch’s popular mobile device management product. Windows 8.1 improvements also include a Start screen with live updates and the option for automatic syncing with a user’s SkyDrive account. • The Windows 8.1 upgrade is free for users of Windows 8. • Microsoft brings back the Start button in Windows 8.1, while adding several other new personalization features to make the operating system more user-friendly. • Enhanced security features deliver improved protection. OVERALL RATING: If your school has Windows 8 tablets, upgrading to Windows 8.1 makes sense. Schools still using Windows 7 desktop computers may not want to upgrade even if their machines meet the minimum system requirement since Windows 8.1 is optimized for touch PCs and tablets, which your school may not have. Finally, an upgrade from Windows 7 will set you back about $50 per machine.